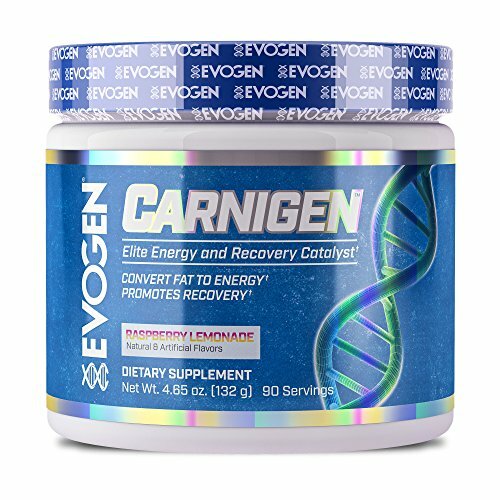 ELITE ENERGY & RECOVERY CATALYST® Evogen Nutrition is known for pure innovation and hard-hitting supplements. CarnigenTM is the latest stimulant-free, ultra-premium and potent carnitine blend, which utilizes the newest carnitine formulation technology to convert fat to energy. To enhance the absorption and to ignite the precise carnitine matrix, CarnigenTM features key vitamins, minerals, and bioavailability enhancers to unleash its dramatic effects. It's the perfect fat-loss solution before cardio or training. Rambod has devised the ultimate carnitine solution which encompasses a blend of four forms of carnitine to help elevate your physique to the next level. It tastes delicious too. Try it and see for yourself! THE CARNIGEN BLEND DIFFERENCE Each form of carnitine selected for Carnigen was evaluated based on efficacy and potency. Some forms of carnitine have poor bioavailability, meaning your body can't readily absorb them. When creating Carnigen, only the best forms were chosen and then combined with key cofactors to ensure maximum effect. If you have any questions about this product by Evogen Nutrition, contact us by completing and submitting the form below. If you are looking for a specif part number, please include it with your message.